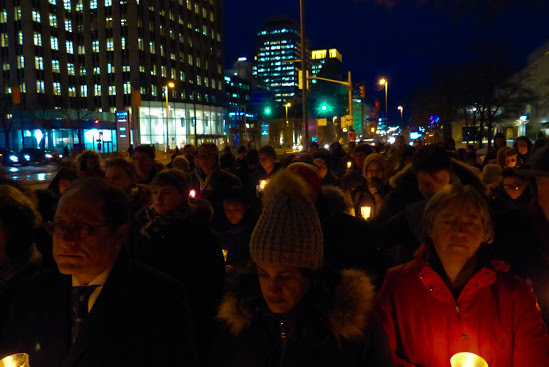 January 29, 2018 marked the 1-year anniversary of the Quebec City Mosque Shooting. CAWI, along with the National Council of Canadian Muslims (NCCM), Somali Women’s Circle Network (SWCN) and DawaNet, co-sponsored a remembrance in honour of the victims and their families. Over 300 people participated throughout the day, which consisted of; a memorial display, where Ottawa residents wrote messages to victim’s families, a vigil in front of the Human Rights Monument, a series of speakers, and the screening of the documentary by DawaNet titled “Your Last Walk in the Mosque”. Next step: Write to the Prime Minister and your MP to ask that Jan 29th be declared a National Day of Remembrance and Action against Islamophobia. We thank Status of Women Canada, Ottawa Community Foundation, CUPE and UNIFOR Local 2025 for financial support to make this possible.